"Salt" has a wide variety of national and international cuisine to choose from. 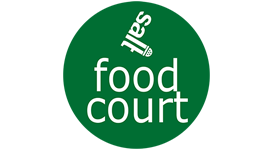 All renowned food joints like KFC, Subway, Burger King, Haldiram's, Pizza Hut , etc., are associated with the food court. The food court is very well designed and structured. A proper seating arrangement for over 650 people has been made in with smart & trendy furniture to compliment the delicious food.